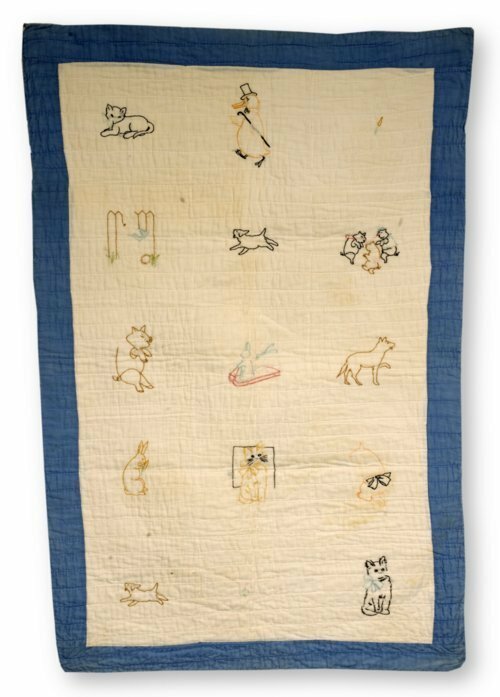 This child's quilt features 15 small embroidered figures on a white cotton ground. The figures are all animals, some anthropomorphized (e.g., duck with top hat and cane). The quilt has a pale blue border, white binding and backing and is machine-stitched, with both machine- and hand-quilting. Mary Carl (1865-1943) made this baby quilt in Parsons, Kansas, probably for her only great-grandson, William R. Hunter (1940-1985).